In the cashflow screen, you can save a copy of actual, budget or revised information at any time throughout the year. What are the benefits to using the Save Copy tool? 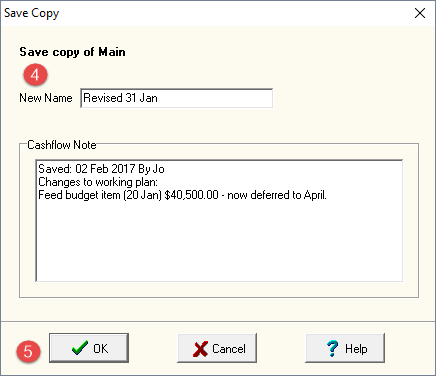 The Save Copy option is a quicker way for you to create another budget scenario for the same year as your current plan. Every time you revise your plan, you should save a copy of it before making any changes. Make sure the actual, budget or revised information you want to copy is on Line One. Click on the Cashflow menu. Name the copy something that makes sense to you i.e. what is the purpose of the copy?